MAMAJI SENDS THIS SPECIAL MESSAGE TO ALL : LET THIS KALPATARU DIVAS FULFILL YOUR WISH TO BE A NIMITTA IN HIS HANDS TO SERVE THROUGH VIVEKANANDA KENDRA. Just as one kind of energy can be transformed into another kind of energy or even as energy can be changed into matter and vice versa, so also one type of desire can be transformed into another sublime desire. Desire has done immense good to human life and it also has caused the greatest harm to society. Tulsidas was an ordinary man with desires and lusts but because of the scolding of his wife, he repented and his lust for animal pleasure was transformed into the highest devotion for God. It was a turning point in his life and Sant Tulsidas was born out of it. Thus the energy was converted, just as in physics we have light changed into heat and heart transformed into energy. Desire, intelligence, strength and power are all potential energies, but if they are used to satisfy the crude desires, they deteriorate the very rationality of man. Thus, as an individual grows from childhood to boyhood and from boyhood to adulthood there is a progressive growth in his desires. It is the intellectual powers that finally determine his future. ON KALPATARU DIVAS, LET'S PONDER OVER THE OPPORTUNITY THAT WE ALL HAVE GOT. BEING IN KENDRA, WE ARE ALWAYS NEARER TO LIFE AND TEACHINGS OF SWAMIJI, EKANTHJI. BOTH ARE GREAT POWERS. THEIR DESIRED AND WORK FOR MAKING BHARATMATA THE JAGADTURU! LET'S ALSO KEEP IT IN MIND AND YOKE OURSELVES HEART AND SOUL IN THIS ANGIKRITAM PUNYAKARYAM! The entire growth of man, one way or the other, completely depends on desires. But the desires which end in pleasures are the cause of all grief and joy in life. It is these desires which mould and shape the personality of man. We find that when a train moves, all the wheels of the carriages start rotating. But they are moved by the prime-mover to which the first motion is given by the engine. So also the desire is the Prime-mover of the entire human activity. In lower animals and insects, we find tremendous effort being made by them to satisfy their very crude and primary desire, e.g. physical hunger. Desire can work wonders. As Israel needs food and aspires to be self-sufficient in it, it has made efforts to cultivate the crops even in deserts. Human beings are in the grip of desires. Desire by itself is not bad at all. It is only when it takes an adverse turn that it becomes a vice. Otherwise it is as sublime as God Himself. In the Bhagavad Gita, Lord Krishna declares desire as one of the distinguished manifestations of His own Self. "Dharmaviruddhobhuteshu Kamosmi Bharatarshabha." Bhagavad Gita VII.11, "O Best of Bharatas, in the beings, I am the Kama "the desire" which is consistent with social order." This desire has a most significant role to play in human life and it is a great power. Man can think for himself and can determine what is right and wrong, proper and improper, good and bad as also beneficial and harmful. He does not depend upon his parents for guidance (which he did when he was a child). 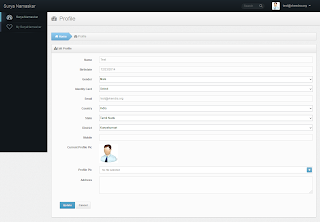 (As he grows,) he enters into contracts and also manages his business. At this stage, all persons are governed by desires. Some new desires are developed in a person, such as sexual pleasure, which was completely absent in childhood. The desires grow with the age and they take various forms. A man is called Dehi (one having a body). But here we find that he is always demanding something (Dehi-'give me') to satisfy his desires, which go on increasing. All normal routine duties have one object only and that is to fulfill the desires which have taken countless forms. But again these desires do not remain constant. One set of desires is substituted by another set of desires. The substratum of enjoyment and pleasure derived from it goes on changing. There is a fascination for one sport, but later on there is a liking for another game. Then the man changes his realm of desires and we find that physical desires are transformed into mental desires. Even bodily joy does not have any intensity. We feel that we derive the best joy from a particular dish or sweetmeat, but after some time our taste changes and one does not reap the same pleasure from it. The potency in the physical pleasures also deteriorates. One may be fond of eating, no doubt; but when he has developed the mental faculties, he finds more pleasure in, say, reading and he either forgets or hesitates to give up this joy for eating. Sometimes, it is our experience that, one forgets to eat, when one is engrossed in reading an enchanting book. The physical hunger does not disappear, but it has ceased to be predominant and physical craving is kept away by the intellectual pursuit. This is how the human being who is running after desires finds himself in the race of fulfilment of desires. The life gets prompted by desires. The life gets into total transformation. As a karyakarta, while getting into the field for work, similar situation is likely to arise, and hence, one has to be more careful. The child grows into adulthood to fully grown man through various stages. In it, one of the important aspect is his selfish attitude. With this attitude, his life can be a successful but definitely not purposeful. To enjoy by oneself is selfishness, but to enjoy along with others is enlightened happiness. How to live with the world is basic wisdom. If the society is saved, I am saved; my safety depends upon the safety of the society. Therefore I must learn to share happiness with others. I want to enjoy the pleasure, but I cannot enjoy unless the society assures my safety. Therefore to ensure my safety, I enjoy along with others. This is selfishness no doubt, but this is "enlightened selfishness". In business, man maintains honesty not only believing firmly, that 'honesty is the best policy', but he follows that honesty because he can win the favour of the customers and the more the customers, the more will be his profits. So also, one must have the worldly wisdom in not increasing one's hungers because they remain not only confined to the physical level but they reach the mental level also and as a result one starts hankering for name and fame, for power and position, and so on and so forth. Thus the 'hunger' multiplies in adulthood as a result of intelligence. It is an artificial development of hunger which prevails. Therefore, proper knowledge is most essential and this knowledge forms the second landmark in the growth from the childhood to the adulthood. Animals fortunately have no logical faculty. They do not imagine nor do they infer. But man, with the sovereign reason generously bestowed on him by God, misuses it and by his logic, imagination and inference finds out multifarious ways and means to satisfy his desires. And what a wonder! With all this, he is still dissatisfied. Man's desires and hungers of multifarious kinds have increased to such an extent that in order to find new means of satisfaction he has yoked science to serve him and thus he is making numerous inventions day by day. He has started exploiting nature in an unimaginable manner and the exploitation of man also in different ways. But the intelligence goes on inventing still new desires and, as a matter of fact, the desires of man have become limitless. There is no end to the sense of pleasure in man. The primary needs of every human being are only a few, but his desires multiply in countless forms, as the primary seven colours have a huge variety of shades created out of them or like the simple emotions expressing in hundreds of ways. Here we remember Mahatma Gandhi saying : God is given enough for need but not for greed! The hunger of man has multiplied and it has not remained the simple original one for food as in the childhood. His development of mental apparatus and intelligence has completely changed that one crude hunger into innumerable desires and he aspires to satisfy all of them. These desires have qualitative and quantitative aspects whereby he desires to raise his standard of living. Surprisingly enough, this standard of living is measured by the wants one has. The more one has, the more one wants and in order to satisfy his increasing wants he has to spend more. So the position of the so-called civilized person depends upon how extravagant he is, how much more he can spend. A few clothes are just enough for a person. But in order to make an exhibition of their social position, people possess hundreds of suits and as many pairs of shoes. This is not because the body wants them, but because the person desires to parade his position and riches to the people. And in the process, the one who wishes to have purposeful life gets into the never ending cycle of needs - desires - fulfilment - new wants - new desires.....and so on. How much is really needed? Remember the story of Leo Tolstoy : How much land does a man need? A child, when it reaches adulthood, adds a new dimension to its life. Adulthood is a landmark in the development of the child into manhood. His physical and mental powers are fairly well developed. He now knows how to handle a situation. Now he has become a rational animal. He can take care of himself without anybody's help. As is said in Hindi now he has reached the age where it is said, "Ab isane hosh sambhale!" "He can guard his own interest!" Man is an animal no doubt, but he is a rational animal. Reason is something which is a special gift to him as compared with other animals. As is said in Sanskrit Subhashita. "Eating food to satisfy hunger, to sleep in order to have rest, protection from fear as an instinct for self-preservation against dangers and multiplication through fulfillment of sexual desire – these are four instincts which are common to man and animal. But intelligence is the special prerogative of mankind. Without intellect they are as good as animals." But this intellect is a double-edged sword. If properly used, it leads a man to become a superman, but if wrongly handled, it makes a man more ferocious than an animal. Animals also possess intelligence, but it is just to satisfy their four natural instincts. When they are satisfied, animals do not care for the world. But with his intelligence, man plays havoc. Animals do not think of tomorrow, but man thinks of storing up not only for tomorrow, but for day after tomorrow also, and in order to satisfy this desire of self-preservation, he indulges in exploitation of every kind. "Keeping in mind the role given to us, we should make best of it to make life purposeful." Please kindly send report to Webmaster Team at webmaster@vkendra.org and not at any individual ID. 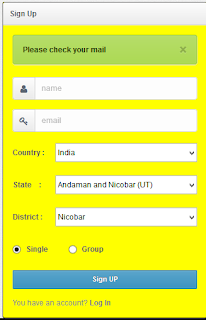 You can send your Branch's Weekly Activity information including Yoga Satra, any event, utsava invitation in well advance so more people can get idea from website. With this plz help spreading the information posted on vivekanandakendra.org by sharing it on facebook, twitter, etc. Visit this group at http://groups.google.com/group/daily-katha. To view this discussion on the web, visit https://groups.google.com/d/msgid/daily-katha/5492FCDA.7050706%40vkendra.org. The child at this stage becomes an independent unit in certain respects only. It still does not understand what is good or bad, what is right or wrong, what is congenial or not congenial. It is not capable of taking any decision by itself. It is only at the age of twenty-one when it has reached adulthood, according to law, that it is taken for granted that its faculties are fully developed. As a matter of fact, until the wisdom tooth is cut, a child is hardly a grown-up person. But the law has to decide on some age and arbitrarily it has been fixed as twenty-one (now it is eighteen). When a child becomes a major, it can then sign contracts and enter into other practical business agreements. But till then it is not capable of valid discrimination and therefore all its actions are taken to be legally invalid. The minor does not understand what is congenial to its self-interest and what is detrimental. Worldly wisdom has not still dawned on him and he is quite ignorant of the proprieties. The real man of the world must know how to behave and to safeguard his interest. So long as this worldly wisdom has not been learnt by anybody, he is under-developed. A man of worldly wisdom knows how to speak, what to speak and where and to whom to speak and also whom to approach for proper guidance. Here is an important lesson of 'how, what, where,whom' of public life. 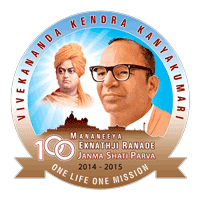 Having understood the urge to serve, determination to transform and detachment from home, Mananeeya Eknathji gave the rules that apply to each world wherein we have to work. The jumbling in application results into difficulties. It is very interesting and instructive to analyze and note the different stages in the development of a child into its adulthood. When a child is born it is only a piece of flesh so delicate and tender that we cannot even handle it properly. It is only in a nebular state and the different limbs of the body are not properly differentiated. Its mental apparatus is almost absent in that state. The sense-organs also are not clearly and properly developed. The hungers which are predominant at a later state are not noticed. The child weeps plays, smiles, eats and sleeps. By itself it cannot express its wants also. It simply weeps and it is the mother who has to judge whether the child is hungry or sleepy or needs something else. Weeping is the only indication of its discomfort; it may be due to hunger or sleep or some ailment. Slowly it develops a feeling and that is for eating. Everything is meant for eating only and whatever it sees or comes to its hand, it puts into its mouth. This one appetite for food alone is seen and other hungers manifest later on. Gradually the child grows, it takes from and some minor faculties are in the process of development. All the faculties of adulthood are not yet to be seen. SuryaNamaskar Clock is going to be launch on Rashtra Chintan Diwas, 25th December 2014, beginning of Samartha Bharat Parv Celebration. Swami Vivekananda meditated on BharatMa at mid-sea roack at Kanyakumari on 25,26,27 Decembere 1892 & find the aim of this life. 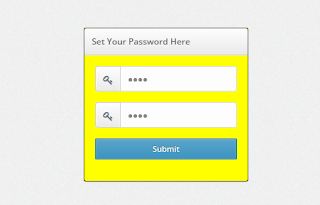 AIM : One can log on to the website http://yog.website and enter the suryaNamskar done by him alone or in group in website. Site will be live at Sunrise time 6:30am at Vivekanandapuram, Kanyakumari by Ma. Balakrishnanji, Vice President of Vivekananda Rock Memorial & Vivekananda Kendra. 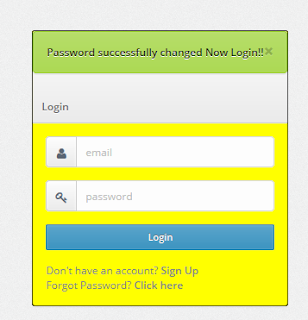 To add SuryaNamaskar, we need to first register ourself. This is one time process. Doing SuryaNamaskars together in a group is preferred. 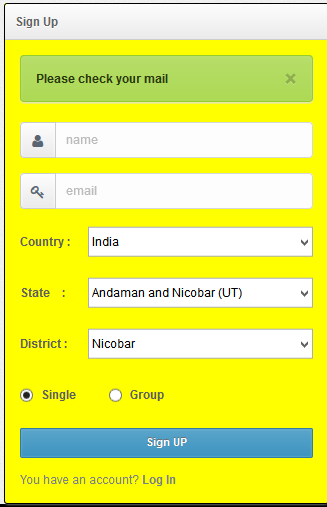 2) If you are registering behalf of group, plz select group other wise select single. 3) Once u click, it will display msg -> " Please check your mail "
5) by clicking it will display the activation link, which you need to click to activate your account. 6) by clicking activation link, it will open the site & ask you to set the password. Plz set your password by entering it two times. 8) At first time, when you enter it will ask for setting the profile. Mobile is mandatory to enter. 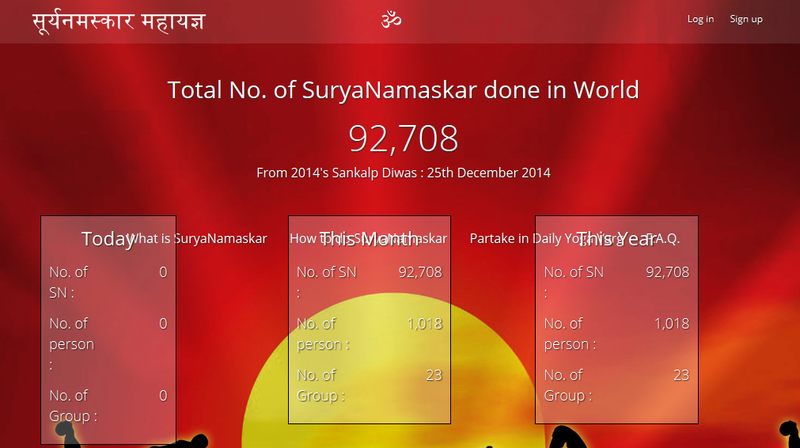 9) After, plz click on Surya Namaskar, to feed the data, you can select the appropriate no. and total will be automatically calculated. 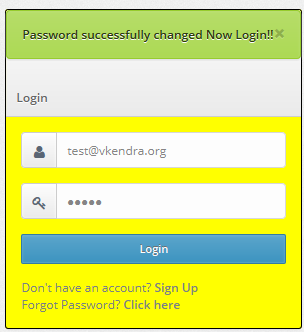 10) You can view your own history by clicking My SuryaNamaskar at left bar. We must increase the intellectual power, by which we reach a higher level. It is a problem to decide what the higher level is, but we prepare ourselves to live on a higher level which is a rich way of living. We live on this earth. We are indebted to Mother Earth. Remembering such realities of life, we have ample opportunities to attain to a higher level of living. There are layers in realities too. But we must live and work in peace. That is the skill in activity: Yogah Karmasu Kaushalam. We have to remember the role allotted and must work accordingly. There should be no confusion or interchange of the roles. In performing an Aarti, the devotee has the lighted lamp in his right hand by which he waves round the idol, but he has a bell in his left hand which he moves to make the tinkling sound. But he does not change the duties of both hands nor does he do the same action by both the hands. He maintains that skill and sustains the different roles of both the hands. This is important. There is not the least confusion in his mind. All this is God's creation and we are living in this world like the travelers. We have to leave this world some day or other. So we should not have special attachment to this world. Use all things around you in the best possible way but for a higher purpose only. We should not forget either of the two worlds, but keeping our attention on both the worlds simultaneously, we must lead a purposeful life. There is a superhuman plane where one has to reach through real knowledge. But real knowledge is not easily attainable. We must open all the windows of the mind to know the best in the world. We are fortunate in having five sense-organs, but there are limitations to their powers. Mind, no doubt, has great capacities, but the knowledge it gains through the sense-organs is limited. And with this limited knowledge we cannot have even the conception of eternity. We are bound by time and space. Such ideas as eternity are words only. They indicate certain symbols but even these cannot be understood by the intellect as it has also limitations. Our mind and intellect are conditioned and hence they cannot go beyond certain limitations. There is the theory of causation. Every effect must have a cause and every cause has an effect. Taking the limitations of mind, sense organs into consideration, we have to make a steady progress from human level to the superhuman level by patient exertion and effort. We must always remain on the human plane. In executing certain things, there should be no compulsion from outside. There should be urge and compulsion from within, on the human plane only. We must keep the two things apart. We must play the role that we have accepted perfectly well, knowing what we are about. If we neglect the realities of life we will fail. Keep the goal before you and be firm on the ground. Those people who are dedicated to the realm of spiritual life only, are unfit for social life. Realizing the hard realities of life around us, we must lead a purposeful life and achieve a sense of fulfillment in life. If the realities are not understood and if the roles are not properly understood, then there is much harm. At Nagpur, an amateur company were performing the drama of "Keechaka-vadha." During the play the actor playing the Bheema's role forgot that he was playing the role and he was so much agitated and furious, that he was about to kill the person playing the role of Keechaka. The people from the auditorium had to run to rescue the poor actor. Thus we must not confuse stage acting with reality. We should identify ourselves with the role no doubt, but there are limitations to it. We must always be conscious of the role we play. Always play the game in the spirit of the game. We should not slothful with the wrong notion that it is just a game, that after all somebody will win and somebody will lose. This is not the spirit of the game. There are certain rules and norms of conduct and still we must be highly spiritual and at the same time highly practical. We must be very careful not to lose a sense of proportion. We must always remember that the world is neither purely spiritual nor wholly material. We must endeavour to have peace in both the worlds. That is an important truth. Manaeeya Eknathji wanted all the workers to work in the society and for the society without any bias. It should be real Karma-Yoga. But that needs shedding of earlier samskaras which would crop up while doing the actual work. If the work itself is to become Sadhana, it has to be done in absolute sense. There is utter poverty and there exist manifold evils in the country. We have to prove ourselves useful to the country. We must lead a purposeful life. These two things, the spiritual and the practical life appear to be not only different, but opposed to each other. But there should be no confusion in our minds. We should be clear about our purposes. We know that when we speak of Brahman, our feet are not on the ground. People steeped in spiritual life think very highly of themselves and refuse to come down to the earthly level. On the other hand, there are people who do not bother about spiritual problems. This world is too much with them and they hardly think of another world. They think only of the hard realities of this world. As a matter of fact, both kinds of people are fanatics. We forget that we are both body and soul. The soul cannot exist without a body and a body cannot live without a soul. We cannot think of the one without the other. In speaking about both of them, we must remember that different yardsticks must be used. You cannot measure the problems of the one with the same yardstick used for the other. The verse says: Brahma Satyam Jagan Mithya Jeevo Brahmaiva naparah. "Brahman is the only Truth and the world is only an appearance, an illusion. The individual soul is no other than the Highest Soul." Very unkind criticism has been leveled against Adi Shankaracharya. They narrate a parable about Shankara's running away when an elephant was coming towards him, in one of those notorious small lanes of Banaras. Somebody mischievously asked him Kim Palayanam. Gajah Mithya. "Why run away! The elephant is just an appearance!" The ready-witted Shankara replied Gajopi Mithya Palayanamapi Mithya "If the elephant is just an appearance, the running away is equally an appearance!" Things spiritual cannot and should not be measured by the yardstick of worldly life. We see a cinema show, we enjoy the same, but we leave the things there only in the cinema theatre, as they are useless in the world outside. We never confuse the cinema show and the actual environment in which we live. There is a wise proverb of practical life. It says: "Work while you work, play while you play." Call from home and being home-sick would be common to many esp. when a person joins after 20 years of secured life at home. The difficulties in the field, irregularity of food, continuous travel and sometimes sickness add to feelings of responding to the call from home. And, therefore, having taken up this important cause in which one has to forget oneself, one should take care of the calls that come from home. Now, about the letters you have been receiving from your home. You very well know that no life-worker worth the name ever thinks of responding to each call from home. By now, you may have also realised that when a worker himself becomes home-sick (or mother-sick or sister-sick) in his field of work, even a casual or customary call from home is likely to assume urgency in proportion to the intensity of his home-sickness. Generally the proportion is 1:10. But, you are a senior Kendra worker and, as such, you are capable of taking an objective view of things, having shed common propensities of the crowd. I should, therefore, leave it to your judgement to assess which call from home is urgent and you should respond to. Of course, if and when you decide to visit home, you will certainly take care that your absence from the field causes minimum disturbance to the programmes in hand. One more presumption is that you have attained a degree of detachment from your family. I received your letter dated 5-7-1976 this noon on my return from Assam tour. Even if I had received it in time, it would not have been possible to adjust my visit to Datia on July 21-22, as my tour programme for July was fixed last month. All those years you must have experienced that I, as a member of the Ranade family, exist only superficially. Seldom I could attend family rituals, whether connected with events of rejoice or sorrow. I am simply helpless. When I come to Gwalior-side next, I shall make it a point to visit Datia to meet you all. My affection and blessings to dear Asha and her children. Convey my Sasneha Namaskars and good wishes to my friends and acquaintances there. Eknathji was a hard task master. Everything is to be taken seriously. Even the training should be taking seriously right from day one by all the newly joined karyakartas. And, therefore, on the very first day, he told them - If you think of home ten times a day, I think you should just go home.